The student population at Carmel Clay Schools is expected to peak in the 2021-22 school year before starting a slow and steady decline, according to a demographic report presented to the school board Jan. 28. The report, completed in November 2018 by Jerome McKibben of South Carolina-based McKibben Demographic Research, states that the student body population will continue to drop – even as Carmel’s population grows – because of a slowdown in new home construction and a rapid increase in empty-nester households. McKibben told the school board that most Carmel residents choose to stay in the city after their children graduate from CCS and don’t downsize until they reach their 70s, a move often triggered by the death of a spouse rather than retirement. He said this will lead to an increase in empty nester households, and with new home construction slowing, it will decrease the student body population. “The number of households turning over will clearly be going up over the next 10 years, but the number of households empty nesting are going to go up faster,” McKibben said. The elementary school population peaked in the 2009-10 school year at 7,296 students. 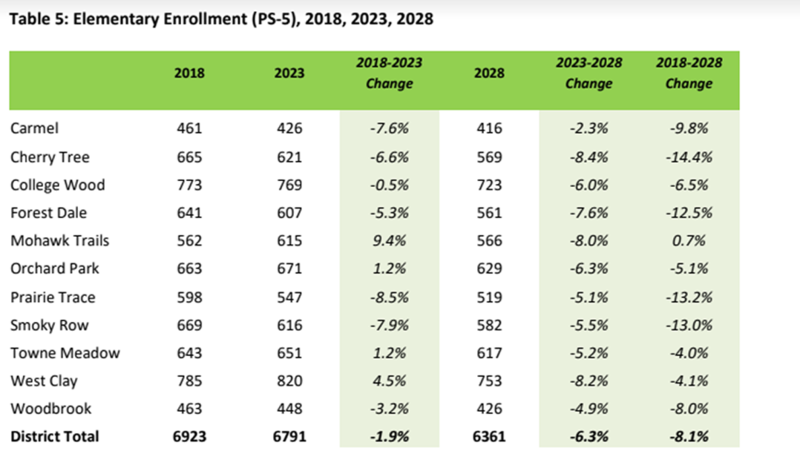 By the 2028-29 school year, the furthest the study predicts, elementary enrollment will be down to 6,361, a 12.8 percent drop from the peak. The study shows declining enrollment at all elementary schools between 2018 and 2023 except Mohawk Trails (9.4 percent growth caused by a very small fifth grade class leaving in 2020-21), West Clay Elementary (4.5 percent), Orchard Park (1.2 percent) and Towne Meadow (1.2 percent). Of the schools expected to grow, all but Mohawk Trails are west of Keystone Parkway. Between 2018 and 2023, the four elementary schools west of Meridian Street are expected to decline in population by .68 percent, while the seven schools to the east are expected to decline 2.9 percent. All 11 elementary schools are expected to experience declining enrollment between 2023 and 2028. CCS has a capacity of about 7,800 elementary students, with 6,923 currently enrolled. During the 2018-19 school year, CCS officials said that of the 800 empty seats, 100 were west of Meridian Street, the approximate geographic center of town. Of the 700 empty seats east of Meridian, 100 were between Meridian Street and Keystone Parkway. The remaining 600 seats were on the east side of town. Roger McMichael, CCS associate superintendent for business affairs, said the forecast results did not surprise him and that they support his 2018 recommendation to close Orchard Park Elementary after the 2020-21 school year and open a new elementary 5 miles northwest. The school board approved the facilities recommendation in June 2018, despite requests from many parents to delay the vote until after the 2018 demographic study was complete. Early in the 2018 facilities discussions, McMichael suggested the district consider closing one or two elementary schools as enrollment declines. 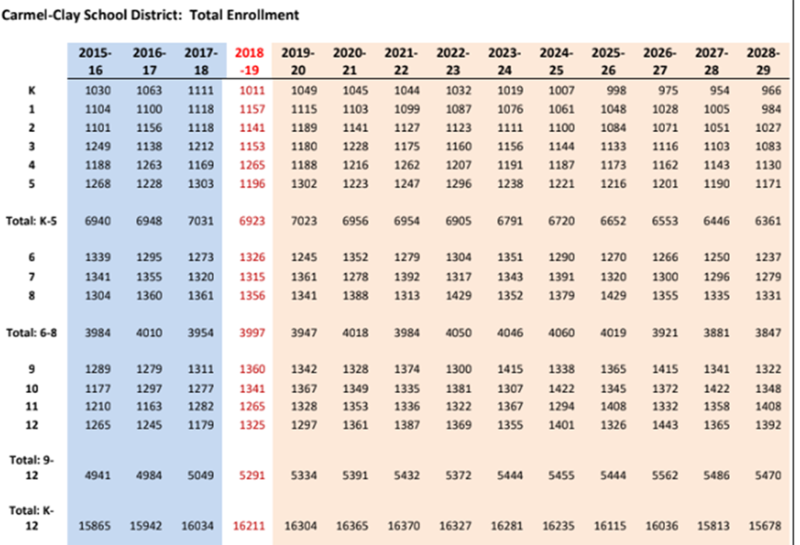 Elementary enrollment is expected to decrease from its 2011 peak by nearly 900 students by 2028-29. Previously McMichael indicated other campuses may be considered for closure if the forecast holds, but the district is not looking at that option now. “It is premature to discuss the number of schools that may be needed 10 years from now,” he said. CCS will redistrict before the 2021-22 school year to accommodate the closure of Orchard Park and addition of the new campus on Clay Center Road. McMichael said he doesn’t expect CCS to complete another demographic study before redistricting occurs. He said the recent demographic study “probably got accelerated a bit” with the 2018 discussion to potentially close Orchard Park or Carmel Elementary. CCS Supt. Michael Beresford said after the school board meeting that officials will look to the 2018 study when developing new elementary districts. He said CCS was “pretty fortunate” to have an opportunity to relocate a school building as the elementary population grows to the west. Other findings show that the student body at Carmel High School is expected to peak in the 2026-27 school year with 5,562 students. The district’s total student body population is forecasted to peak at 16,370 students in 2021-22. Carmel’s median age is expected to climb from 39.1 in 2010 43.6 in 2030.